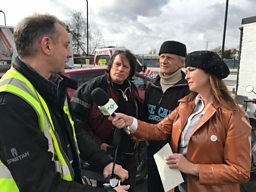 BBC Radio 5 live - In Short - Can you convince a petrolhead to go electric? Can you convince a petrolhead to go electric? I’ve been riding motorbikes for 25 years or so – petrol motorbikes mainly. I fell in love with biking because of the sound, the smell, the feeling of total freedom on the road and basically I’ve always thought it’s pretty cool being a biker. Now the team from 5 live’s climate change series Cool Planet have asked me to drag myself out of the dark ages and have a look into electric bikes. 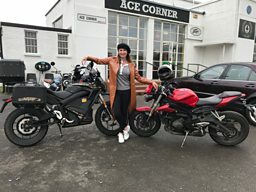 So I went to meet some enthusiasts to see if they can convince me; motorcycle journalist Paul Blezard and Jeremy Boorer who sells eight brands of electric mopeds and motorcycles. 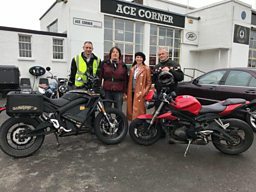 You don’t hear them arrive when we meet at the bikers’ café off London’s North Circular road and this is one of my issues with electric bikes - no sound! But that is one of the things Jeremy likes about them – especially for trail riding - he calls them stealth machines. But what about safety? I like to be on a bike and be able to rev my engine if someone is getting too close or to say I am coming by. Jeremy says it doesn’t matter because “everyone’s walking around with their headphones on anyway”. He is not giving up though. “There are regulations coming in though from the EU so these bikes will have to make noise eventually,” he says. 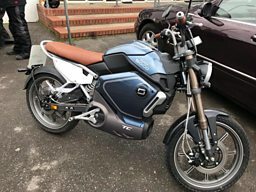 Paul Blezard does admit electric bikes aren’t perfect yet, but for him they’re like a “magic carpet ride”, with plenty of power… you’re just floating along without noisy distractions. Talking about noise, there’s no missing Ace Café owner Mark Wilsmore’s entrance. “Pure poetry that sound,” he smirks as he revs it up to pull alongside the electric bikes plugged in to the charger on the wall. He’s a dinosaur like me and is here to back me up. And that is my other issue - the charging. When I go to a petrol station it takes me 30-60 seconds to fill up my bike and I’m off – not something you can say about an electric bike. Jeremy Boorer has a response for that; “the shortest charge on our bikes takes three and a half hours, but they also have removable batteries so you could charge it inside the house, or take multiple batteries, or take a charger with you and plug in to any 13 amp plug”. That’s far too backward for Mark. “This sounds like the early days of motoring when everyone rode horses - and if you drove, you had to take petrol with you because there weren’t any gas stations. Paul then tells me about friends of his who went around the world in 80 days on electric motorcycles back in 2010. He says they had every kind of plug you could imagine and they were plugging into telegraph poles in Kazakhstan. That’s all very well, but for people to make that switch from petrol to an electric bike it has to be made easy for them. I’m wondering whether instead of trying to convert people, manufacturers will have more success aiming at a younger generation - in the same way Formula E have aimed at a younger generation as opposed to Formula 1. 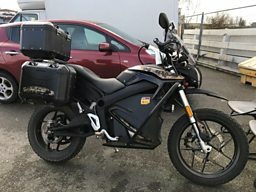 If you’ve never really ridden petrol bikes and you jump on an electric bike, how brilliant – you have that instant speed and they’re so easy to use with a 'twist and go’ scooter style throttle. But do you really get the thrill from electric? Paul Blezard is a total convert: “You get a bigger oomph from the torque because you get maximum torque from zero revs – and you’ve got to be careful - they can spit you off if they don’t have traction control - I’ve seen it happen. So have they managed to convince me? I’m convinced electric is the way things are going. Regulation and the environment are also on side. I’m not convinced it’s as much fun as being on a petrol bike, but I do think with the developing technology that in time everyone will be on electric bikes and petrol bikes could become a hobby for purists. Click here for more from BBC Radio 5 Live's Cool Planet season. How do you flood-proof a town or city? What flood-proofing tips can the UK learn from the Netherlands? Scarlette Douglas investigates two housing projects in Nottingham aiming to save energy. You’ll have heard phrases like carbon footprint and carbon neutral but what do they mean? Matt McGrath explains. Can a BBC reporter go 'carbon-neutral'? 5 Live reporter Nick Garnett measures his carbon footprint through a usual working day.